You probably wonder why have you lost your self-confidence. You are not the only one. On last Wednesday I went through my family albums. It is always fun to see my childhood photos. Suddenly it hit me: my early year’s photos show a self-confident, happy boy. No fears, no awkwardness, no shyness. I’ll bet your album shows the same thing. As I turned more and more pages of that album, I could see the process of that confident child turning more shy and awkward. The same eyes that looked straight into the camera, are trying to hide from it. Sure, some kids that have this built-in self-confidence that lasts. We all know them, the people who seem fearless, walking around as if they own the place. But most of us grow up to be more reserved persons that hesitate before new encounters, new places, new job, etc. read on and I would explain what is causing that transformation, and give you some technics on how to gain your self-assurance back and how to build confidence in general. what happened to our confidence? So what happened? In my opinion, the thing that happened is “society”. Society is a great thing. Friend, family, laws are there to protect us. The downside is that the community brings with her judgment, criticism, and sarcasm. As we grow up, our parents and other adults, teach us things. After all, they are our tour guides to society… They do this with good intention but this process brings up judgment. You do something incorrectly (in their opinion) they are correcting you. This makes you reluctantly feel wrong. You make an effort to avoid this criticism next time. Becoming less spontaneously is unavoidable. You become a calculated person. You are thinking about everything you want to say or do. Parents do it. Teachers do it. Almost every adult in our surroundings unknowingly helps us build our awkwardness and fear of others. We go to the kindergarten and our friends come into the picture. Suddenly there’s a bunch of kids staring at us, testing us. We learn to hide our weaknesses to avoid being laughed at. We start looking at others for confirmation that we are doing the right thing. We wait to see if others laugh at that joke so we know it’s funny and we can laugh too. We are afraid to contact those who others laugh at. We lose ourselves. A Seagull flies the way he flies. The Seagull doesn’t wait for others to tell him that he flies well (I hope you have read the great book “Jonathan Livingston Seagull” and if not hurry to get it here: Jonathan Livingston Seagull: The Complete Edition ). The Seagull is free to do what he does. We lost his freedom. We lost our self-confidence. We can no longer fly as we want, so we stay on the ground. Because most people are afraid of change and fear of new places, they stay at whatever job they have. They stay in the places they know and are reluctant to try new things. Believing in ourselves is like the spine of our being; when we lack it we are mentally paralyzed. We are stuck. We think we are in a cage, cage built from our fears. The good news is that the cage doesn’t really exist. This is an imaginary cage. So let’s break it off and get our damn confidence back! The first step of every change is awareness. We have to be aware of our current situation to make a change. When we are going to build a confidence, I think the best way to start would be with the same thing I mentioned at the start of the post: going through childhood album. Why? Because we should realize that the fears weren’t there at the beginning. Only when we understand that the fears are not part of us, only when we grasp the fact that they are external, we can start gaining our confidence back. Go over your childhood picture, look at them carefully. Notice how innocent you were. That child in the picture was the most vulnerable point of his life, yet his confidence was at his highest point. When I looked at mine, it took me a while to get in touch with the child I once was. In the beginning, I felt he was a complete stranger to me. What does that little baby have to do with me? After a while, I felt a warmth spreading in my body toward the child I was, the child I am. After you truly grasp the notion that the fears and limitations weren’t yours, you are ready to start gaining your confidence back. Wait, but how the hell, can you gain your confidence back? To feel self-confident you should experience positive feedback, but how can you do that when you don’t have any self-confidence? It is a Catch-22. The best way I know to break that chain of Cach-22 is to lie. Wait, what?! Yes to lie, well not exactly lie, it is more like acting. You know the phrase “fake it until you make it”? This is exactly what I mean when I say acting. You need to make a list of all the characteristics you think a confident person has. Write down what are the external characteristics of them and then imitated those characteristics. It is difficult and requires a lot of practice, nevertheless, you can do it. The results will surprise you. If it is too difficult, you may want to choose one thing first. For example, look at the other person’s eyes when you talk to him without moving it. In the first few times, you won’t succeed. Nobody does. But after a while, the time period that you actually succeed, not moving your eyes will get longer and longer. Suddenly you will realize that you haven’t moved them all. Great! Give yourself a little present and chose another confidence aspect to work on. Bits by bits you will learn how to build confidence until One of these days you will realize that you are no longer faking it. A self-confident person is who you are. 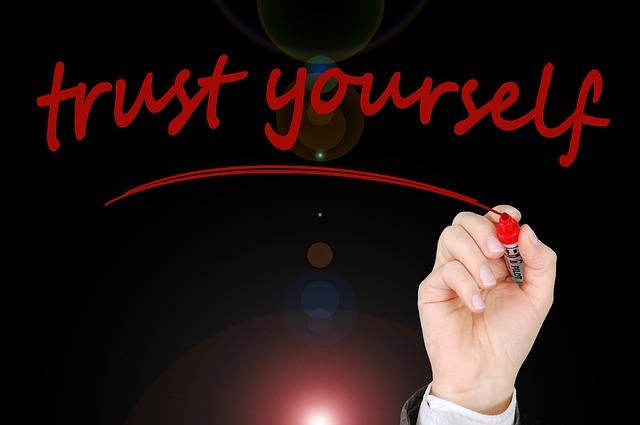 when you’ll be self confident you will also improve the process of decision-making. Bringing back that self-confident child is not easy, to say the least. Yet, the knowledge we weren’t born shy and full of fears, the knowledge we grew our fears later, should give you strength. The change can be reversed. You can become that confident person again, and build a confidence. Use the tips I gave you and start making your journey, one step at a time. Let me know how that worked for you. Write a comment to the post, it would mean the world to me.